The same year that Elvis Presley joined the Army and Eisenhower created NASA, the Historic Academy of Music Theatre closed its doors. But after 60 years of silence, the theater will re-open Thursday, Dec. 6, celebrating with a full schedule of events. The evening of Dec. 6 will bring the historic theater to life with “In Unison: A Concert Evening” featuring Mavis Staples, gospel singer and civil rights activist, and Devon Gilfillian, known for his soulful music. 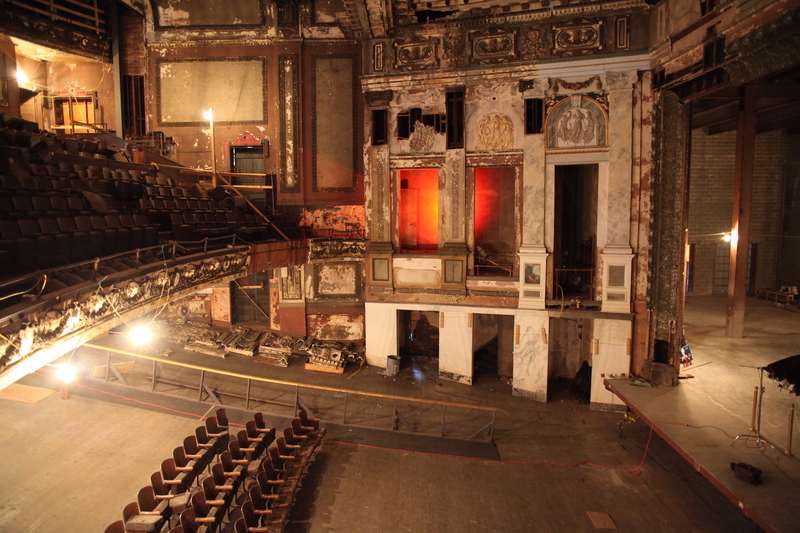 AFTER — The historic theater will open 60 years after closing in 1958. Just over a week before opening, the theater bustled with the final stages of construction. Workers painted trim, rigged the fly system and marked dings in marble walls with bits of green tape. Sawdust coated some patches of the purple carpet and rows of spotlights hung low over the stage. The plaster faces of lions and the muses, molded from casts of the original theater’s décor, presided over the rattle and clatter of construction. Rows of plush red seats lined the orchestra, boxes and balconies, ready for audiences to enjoy events including music, movies, dance, opera, and more. The theater has completed a transformation from dilapidated memory to the glory of its 1912 heyday. Griffith stood reviewing glossy season brochures near stacks of cardboard boxes and coiled cords in the new lobby. As she toured the theater, Griffith pointed out details such as the pit elevator in the stage, which can rise to extend the stage or sink to allow two more rows of seats. To preserve the building’s history, the lobby was built in clean lines of cool grey and white from the wide concessions counter to the accessible elevators. Dark wood salvaged from the old theatre accents the grand staircase. Visitors who look up at the brick wall connecting to the theater may notice a set of green doors opening onto thin air in the lobby. Griffith said they were left to maintain the historic façade. 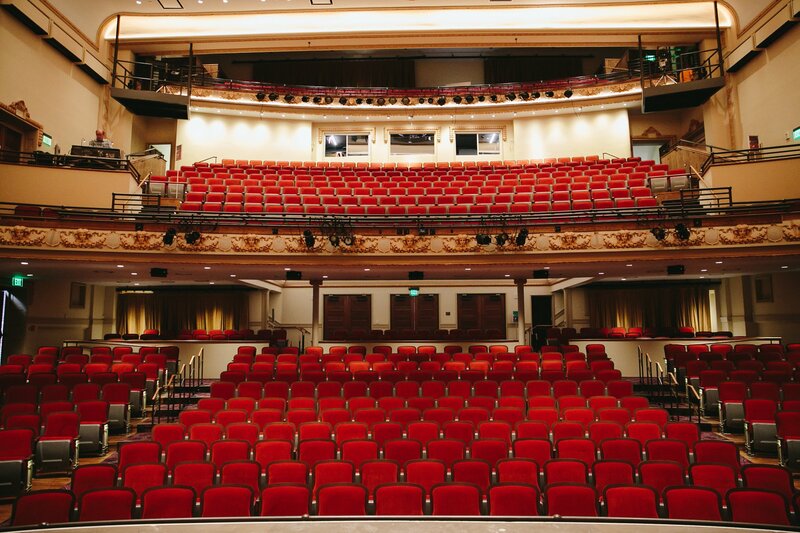 The theatre first opened in 1905, hosting performance legends like actress Mary Pickford and dancer Isadora Duncan. Community leaders rebuilt the theatre after a 1911 fire, making it a center of Lynchburg’s culture. It became a movie house in 1950, outlasting several area theatres, but closed amidst an economic downturn and was barely saved from demolition, according to the Academy of Fine Arts website. As the Academy Center of the Arts grew, so did efforts to restore the theater. BEFORE —LU president Jerry Falwell Jr. was instrumental in the preservation and restoration of the theater. Liberty’s president Jerry Falwell Jr., a lover of local history, had a hand in the preservation of the historic theater. While still in law school, Falwell convinced his father, Jerry Falwell Sr., and Liberty to buy the theater and renovate it, with the vision to make it a theater for the university. But Liberty was struggling financially, and the university passed the theater back to the previous owners, with the project still incomplete. According to Falwell, Liberty donated a “sizable amount” to the Academy Music Theatre years later to aid in the completion of the renovation. “We’re just thrilled to see that it’s finally coming to life, and we think it’s going to be a real asset to (the) Liberty University community, and to the whole Lynchburg community as well,” Falwell said. Opening week events include a holiday movie marathon Dec. 8, performances by the Academy’s five resident companies Dec. 11, “The Nutcracker” ballet Dec. 15, and Michael W. Smith Dec. 22. In February, Alluvion Stage Company will perform “The Will Rogers Follies” with student performers from Liberty University. Ticket prices vary depending on event and seating, but with some events at $5, the Academy wants to welcome the entire community to experience the restored theater. Griffith said the box office phone has been ringing constantly. For more information and tickets, visit academycenter.org.